Editor's Note: Yesterday, we put up a story from our archives about hero-worship of Rutherford B. Hayes in Paraguay. 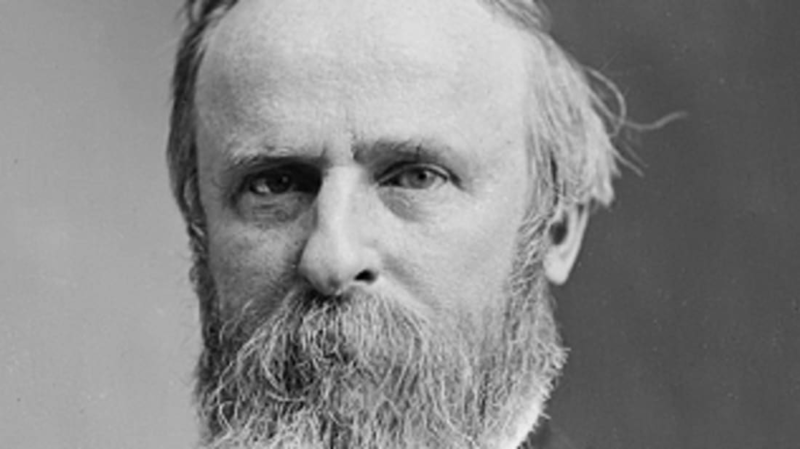 "Repost old articles about Rutherford B. Hayes" week continues with Jenny Drapkin's look back at the election of 1876. No matter what you think of the current political process, no election in American history is more shameful than the Hayes/Tilden election of 1876. Even though the election of 1824 is known as the Corrupt Bargain, the most corrupt bargain of them all happened in 1876, when a fairly honest politician, Rutherford B. Hayes, compromised the fate of millions of freed slaves in a backroom deal to become president. How this came to pass after Hayes lost the popular vote by 3 percent and almost certainly lost the electoral vote was a categorical perversion of democracy. But it was a strange time in America. The country was still healing from the Civil War, and Reconstruction had been going so poorly for so long that many Northerners no longer cared about rebuilding the South. The Republicans, a.k.a the Party of the Lincoln, had been in control of the White House for 16 years, thanks in part to the votes of black men below the Mason-Dixon line, who risked their lives by showing up at the polls. Lynching was on the rise, and only the presence of federal troops in the South kept the violence under control. But the Republicans weren't just a party of saints. They also stayed in power through a well-organized, corrupt party machine, which readily made cash and ballot boxes disappear. After a series of scandals, many voters wanted them out of office. And so in 1876, both the Republican candidate, Rutherford B. Hayes, and his opponent Samuel Tilden expected that Tilden—the Democrat—would win. In fact, as the sun set on the eve of the election, both men went to bed believing that Tilden had carried the day. Little did they know that in middle of the night, party operatives would be busy making sure that every vote did not count. To be fair, the Democrats had henchmen of their own, but the Republicans were much more effective. In the weeks to come, fraud, bribery, and intimidation left the results of three states in question—Louisiana, South Carolina and Florida. If Hayes somehow managed to take all three states, he would win the presidency by one electoral vote. But the biggest losers were ultimately African Americans in the South. The aftermath of the election gave rise to the Jim Crow laws, and so in a bitter twist of fate, Southern blacks became second-class citizens in order to keep the Party of Lincoln in power.Â It would take 90 years and one Civil Rights Movement to undo the events of 1876.